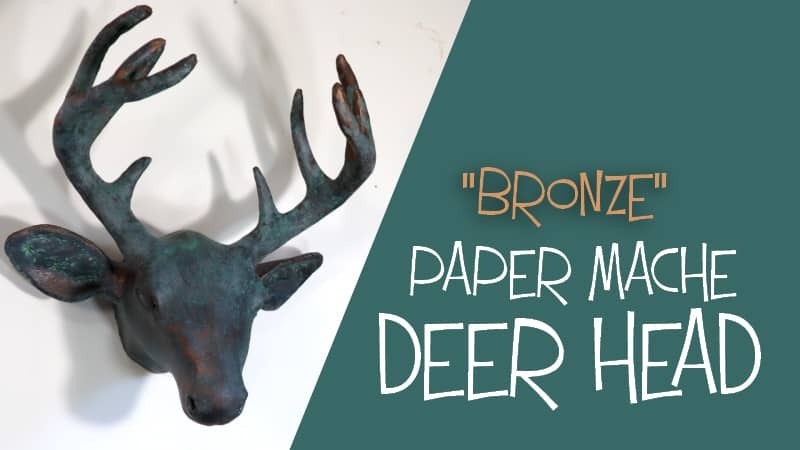 Paper mache animals can look like real bronze with this easy technique. You can see find the deer head pattern here. 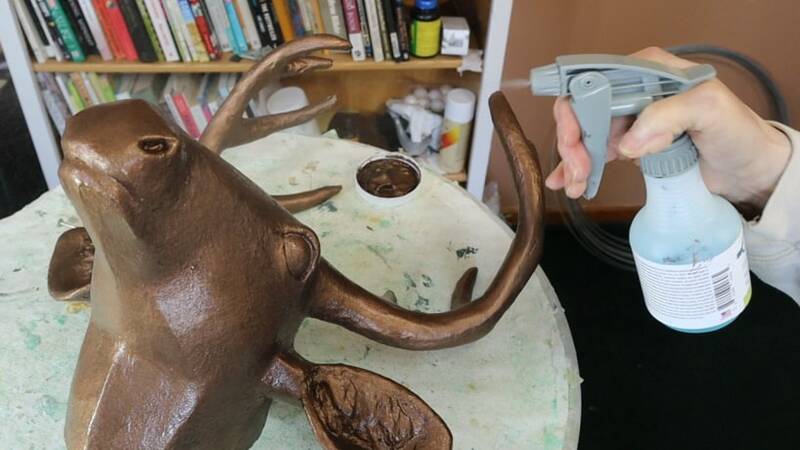 There’s a video on that page that shows you how the antlers are made, and how it was painted with realistic colors. I don’t normally make two of the same sculpture, but I wanted a bronzed deer head to go with a painting my daughter gave me. They’re both now on the wall in my living room. I ordered my bronze coating and patina from Brick in the Yard. They have some great videos, too, so look for them on YouTube. I’ve also used their iron coating – and I love it. The patina creates a much softer rusting effect on the nice black iron surface – you can see how that looks on my raven. I faked the same look with acrylic paint on my gorilla mask. 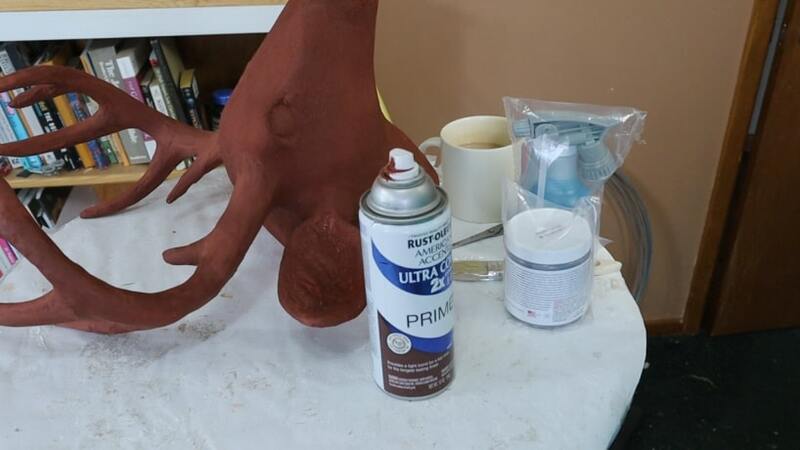 Use a spray primer over your paper mache animal. I used an iron oxide colored primer, although I lost the cap so I don’t know what the Rustoleum people call the color. The bronze will completely cover the primer so it doesn’t actually matter what color the primer is. You could use an acrylic gesso, if you’d rather do it that way. But don’t use the DIY gesso recipe on this site, because it’s too absorbent, and you’d need to use more coats of the bronze coating. That stuff isn’t cheap! Stir the bronze coating, and then paint it on over the primer. You don’t want to leave brush marks, so stipple the wet paint after you brush it on. This will make it look like you’ve got little points all over it, but don’t worry – the coating will level out as it dries, and it won’t leave any brush marks. When the first coat is dry, brush on the second coat. You need to work fast, because the patina doesn’t work on dry paint. 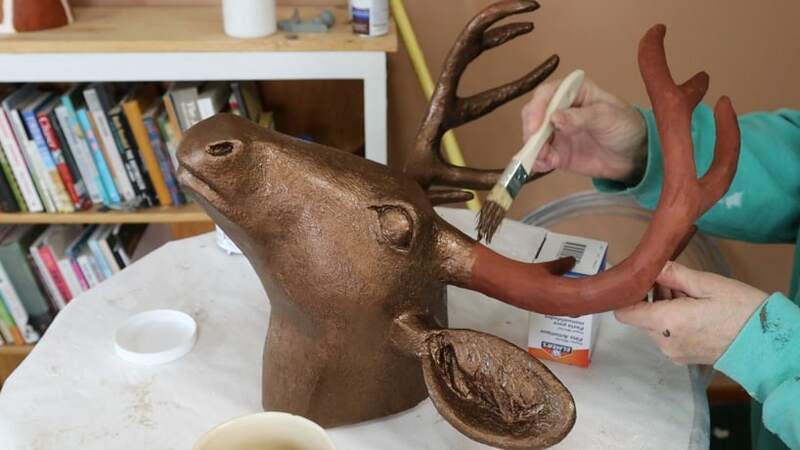 I did this in several stages, because it isn’t possible to coat the whole deer head, including antlers, before some of the paint starts to dry. Spray the patina lightly over your wet bronze coating. I used the Light Green patina this time. I should have used the Tiffany Green patina, like I did for the Ballerina Bunny. The Light Green came out very bright, as you can see in the next photo. The patina takes time to turn the bronze coating green. 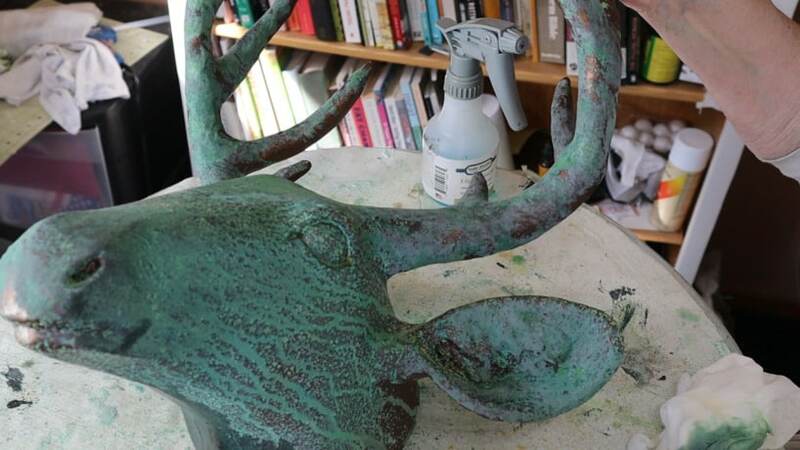 My spray bottle was running out of patina, so I didn’t get an even coat of patina on the deer. That’s why you can see the runs. I used a brush to stipple areas, which you can see on the antlers, and that came out better. But it was still way too bright for my taste. I used a wet paper towel to remove much of the patina. I only did this because I didn’t like the brightness of the patina I chose to use. I didn’t do this when I bronzed my bunny, because the Tiffany Green patina is a much softer color and I liked it immediately. I used DecoArt Soft Touch varnish to seal the bronze and patina, but any good acrylic varnish will work. The varnish may darken your patina, so test a small area before you apply it. For even faster way to seal your paper mache, use a clear coat spray varnish. 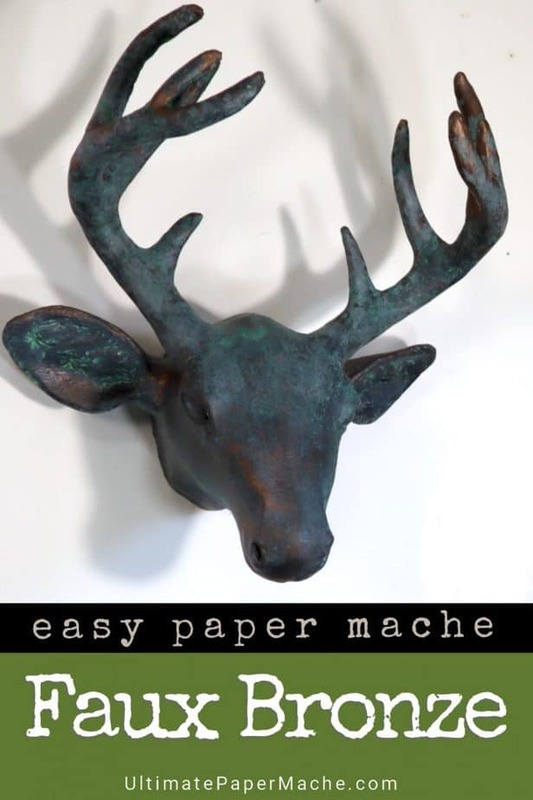 So tell us what you think – do you like the way the bronze coating looks on paper mache? Is it something you’d like to play with? Or do you prefer the deer head painted in realistic colors? 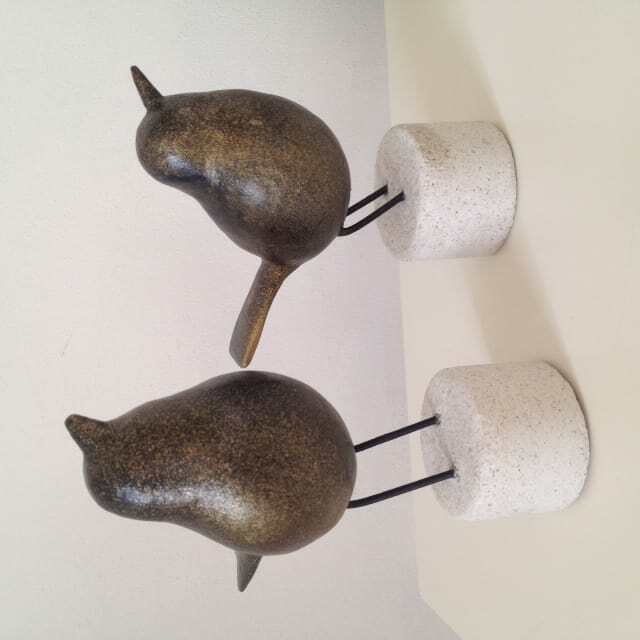 And have you used a metal coating on paper mache, or used acrylic paint to mimic a bronze or iron coating? Whew – that’s a lot of questions! But go ahead – let us know what you think in the comments below. I definitely like it better after you fixed it! I am wondering what it would look like if you did your initial spray MUCH lighter…just a light mist where there was no dripping. It might alleviate you needing to wipe it off? As usual, your work is amazing and the end result is awesome! Hi Chris. I just found out that Sculpt Nouveau does have a UK distributor. You can find them here. If you try the product, please let us know how your project turns out. 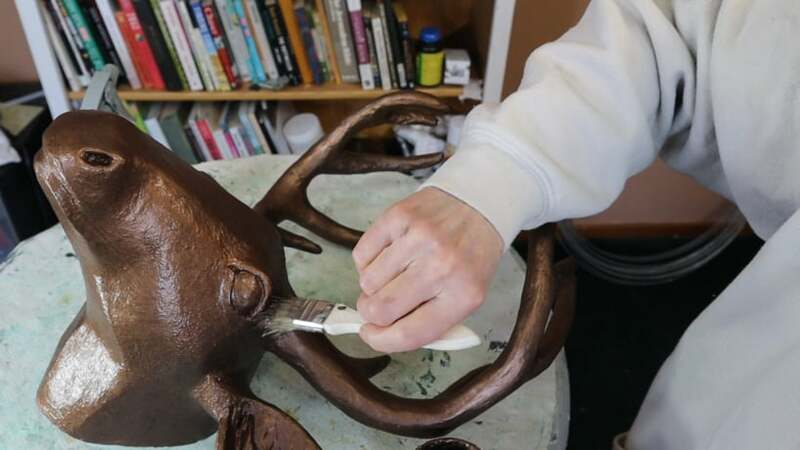 Also, if you’d like to see how we’re actually supposed to do it, watch < https://youtu.be/8YGz2gHDh4Q>this video about darkened, old bronze by the folks at Brick in the Yard, (it would look great with any animal sculpture) or their video using the Tiffany Green patina and the bronze coating. Yes I like the way you finished it -looks like real bronze. I’ve used products like that before and they all need tweaking . But it is fun to see how the sculpture changes into something that looks ancient. Thanks – I’m glad you like it. Love these birds! thanks for sharing the technique! I like it softer. Looks more realistic. Nice Jonni. You know any way you achieve the desired results is acceptable! I use this product frequently both with paper mache and with Pal Tiya. One way to avoid too much patina is to very lightly spray from a bit further away. That way, you don’t get too much of the drip marks. I have even used a fine mist spray bottle so you don’t oversaturate the piece with patina. I do admit to pouncing with a damp paper towel to wipe some off. Another technique is to drybrush over the patina with some more of the bronze coating. It gives that darkened look that you said you wanted. You have to use an acrylic clear spray over the piece once you get it to look like you want because the patina will continue to react to the bronze in the paint in the metal coating. I never tried the black acrylic with gold metallic paint like some of the comments. That was a neat look as well and it certainly would be cheaper! A finer spray would have been much better. Next time I’ll use one of my own instead of the one the product was sent in, and use the Tiffany patina. Which version of patina do you use with the bronze coating? I have used Tiffany green, light blue and believe it or not, purple. The purple is kind of cool, it gives a faint purple color but mostly makes it look like dark bronze. There isn’t too much difference between the light blue and the Tiffany, it’s hard to tell the difference when they are done. I had to repair a sculpture and I forgot the patina color I used. Even after studying the original, I deduced it was the green, applied it and then realized it must have been the blue because it didn’t look quite right. I had to redo the repair! I guess I should keep notes in the future. If you use your own spray mister, make sure you really clean it out afterward because those patinas are really caustic and will rust the workings. You probably already knew that. The purple sounds like fun. I like bronze that look darkened with age, and I can imagine a lot of sculptures that would look really nice that way. I definitely liked the patina look better after you wiped it down. The other was too dark for me. I’m trying to remember what the cannons looked like that had a patina finish — that we had to clean down to the bronze. I do love a bronze finish, but I think the bronze was too dark on its own and looks better with the patina on it. Thanks for a wonderful video. Hi! 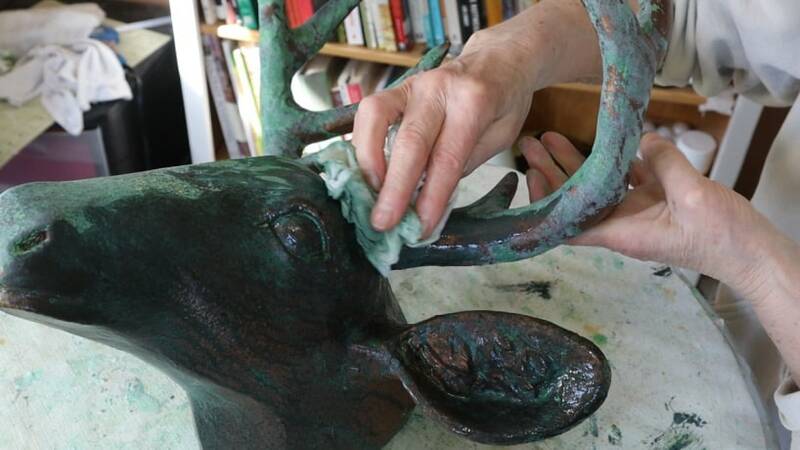 I loved the deer both with the initial bronze paint covering as well as after you softened up the green. The birds are cool too. Wow, I love the deer it looks great! Thanks for sharing, I would love to try that paint. I will have to see if I can get it over here in the UK. Is it acrylic based do you know or more of a heavy duty paint? Hi Susan. It’s an acrylic base with bronze powder in it. The patina spray is acidic, I believe. You could contact the Sculpt Nouveau folks directly to see if they distribute the product in the UK. If they don’t, they might know of a company in the UK that makes a similar product. Thanks Jonni, I will take a look at their website. I really love the way your deer head turned out! Hi Jonni, I just love your website and ideas! So inspiring! I used to have a craft shop with poured ceramic pieces. I sold both greenware and bisque pieces. When I want to have a bronze look I painted the piece with a reddish-brown craft paint then sprayed it with a satin finish. Once that was dry I’d make a wash of a turquoise or jade green craft paint, flood it on and wipe it off with a soft cloth to the level of patina that I wanted. When that was dry I would use a tiny bit of metallic wax that came in little tins or glass jars and lightly rub a little on the highest points of the figure for highlights, blending it with my finger to fade it out. Then I finished it with whatever sheen I wanted. This technique gave me complete control and it was not expensive at all. That sounds nice. Jeannie. I even have a little tin of bronze wax. One of these days I’ll try it. Do you still work with clay? I haven’t done any pouring in years. I still have some molds and a kiln thinking one of these days… but I have some fired pieces I may paint yet. Someone mentioned pastel pencil for fur. I painted a lion in an ivory paint and used regular pastels to do his mane and add a blush of color to the body and face. It can be really messy but you can get really nice blends of color that way. You can work the color by spraying the piece with a matte sealer then add more pastels. I like the deer painted with acrylics. I would have been tempted to add pastel pencil fur and might have overworked it. I like the patina deer better to go with my decor. But the folk art look is cool, like hand of the artist. I’m going to try the green patina look on some branches to make a doll. Too much fun. Interesting idea! I hope you’ll let us see how your doll turns out. Hi Jonni, I use Golden Artist black acrylic paint, then paint their orange iridescent paint on top of the black, and rub it off with a damp cloth to get a bronze effect. Your bronze effect turned out good too. Nice idea – do you have a photo of something you’ve made using this method? We’d love to see it. Hello Jonni. Thank you so much for all youre information! Wow, the birds are beautiful. Love them. Jose, I am in love with those birds. I think I need to get a little more modern with what I do, like these. The forms are beautiful. Thanks. I really liked the bronze, I would like patina in some places not all over. It does look much better after you wiped it down the softer patina is best. It not only goes very good with the painting but the clock as well. TFS. Always enjoy listening to you. I don’t know how to put the patina on just some parts – I know that should be easy, but I haven’t figured it out yet. Does anyone else know, by any chance? ?